As an alternative to expensive multi-touch display surfaces, a group of hobbyist engineers decided to try to build their own and in doing so, open source the hardware and the software. What came together was a community created project called the Play Surface at playsurface.org. Of course there are multiple uses for a multi-touch display. Undoubtedly though one of the biggest possible verticals for multi-touch displays is education. Both smartboards and smart projectors are turning to multi-touch interfaces allowing teachers, presenters and even students to present at the same time in the same presentation. Multi-Touch displays are great for real time collaboration as well. In the classroom, multi-touch displays can also be great for educational gaming. That’s what we got to see with Play Surface’s multi-touch table. While some of the games we checked out were casual games, others had principals of physics and problem solving built in which makes for a unique educational experience. Play Surface sells the actual multi-touch display as a stand alone system or as a peripheral and at a cost of more than 50% off similar devices from the big named companies. 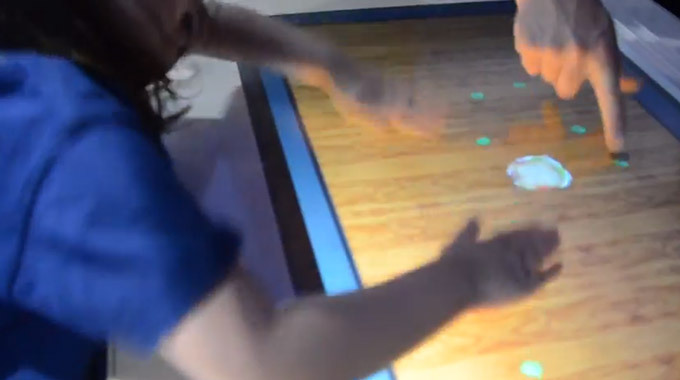 The peripheral touch table is $2700 from the playsurface website. The table with the computer included is $2995.